How did a legal aid attorney’s simple request for a few maps turn into a documentary film and an educational curriculum about equity, public discourse, and what it means to belong in 21st Century American society? First, it is important to understand that the Kirwan Institute was created to be an interdisciplinary, applied research center within an academic setting. In other words, its work is to focus on a variety of topics related to racial inequality, and the products of its work are to be useful in the effort “to create a just and inclusive society where all people and communities have the opportunity to succeed.” After a decade of groundbreaking research and mapping, working with partners in regions across the country, it became clear that stories are perhaps the best context for understanding data, maps, and ultimately, how communities change. This realization has led to a number of innovations in the research and communication tools produced by the Institute in recent years. During the summer of 2013, Ellis Jacobs1, a senior attorney with the Dayton-based Advocates for Basic Legal Equality, reached out to the Kirwan Institute about a letter of finding that had recently been issued to the City of Beavercreek by the Federal Highway Administration. The finding came after a two-year investigation that began as a result of a complaint filed by Jacobs’ firm in 2011. The Kirwan Institute had contributed a series of maps to the appendix of that complaint, so Jacobs was following up to inform the Institute about the historic nature of the finding, since this was the first time the FHWA had ever concluded a Civil Rights investigation in this way—Jacobs was sounding the alarm that this represented a new legal approach that equity advocates around the country needed to understand . The Kirwan Institute is considered by community partners to be a “sacred convener” because of how the work of the Institute helps to create safe space to discuss the otherwise uncomfortable and contentious matters of racial inequality in society. After reflecting on the way the public transit controversy had transpired in Beavercreek, it was determined that the Kirwan Institute could offer the most appropriate perspective on the story and how race and class became such a divisive thread throughout the dialogue. Having just released its first ever cinematic production in November of 2013, A Reading of The Letter From Birmingham Jail, the Kirwan Institute was also poised to take on its next big project by producing what became Free To Ride, the organization’s first feature-length cinematic documentary. This educational companion was created to complement the film, with the vision of using the Free To Ride story as a teaching tool in community forums, as well as high school and college classrooms in order to increase the understanding of the tangible effects race has on the policies and procedures that shape our communities. Inevitably, the various themes underlying Free To Ride are too many and too complex to completely unpack in the documentary. The purpose of this companion piece is to delve deeper into the issues embedded throughout the film in order to foster a better understanding of how and why stories like this take place in our society. Our hope is that through this modern-day real life story of justice, this work will spark healthy dialogue by helping viewers and readers to think critically about history, and about what new civil rights movements can look like. This story provides important lessons about the nature of race and inequality today in a variety of ways. First, although the details of this saga unfolded in the particular community of Beavercreek between 2010 and 2014, these events could have taken place in any part of metropolitan America. In fact, transportation equity has remained a source of conflict throughout the nation as far back as Homer Plessy’s attempt to board a Whites-Only railcar in 1892, making Free To Ride a relevant case study for understanding historic challenges behind how and why our transportation system works better for some than for others. Additionally, it is particularly striking that we continue to face issues like this in 21st Century America, which no longer manifest themselves through overt racism or Jim Crow laws, but through subtle attitudes that impact discretionary decisions that affect people’s lives in ways that aren’t easily understood. It’s easier to understand the intent and effect of Jim Crow laws, but it’s much more difficult to comprehend the meaning of disparate impact theory and how it relates to daily commuting patterns. The ways in which race operates in society today are different than in past generations, but they have evolved over the years to become more subtle and less detectable. Far from the more overt and explicit racism of the past, today’s society is more influenced by structural inequality and unconscious biases that play into the daily decisions of individuals, corporations, elected officials, and administrators who continue to shape our communities. Free To Ride captures the complexity of today’s racial politics by unearthing the nuances of a contemporary American story. Though racial biases operate differently in society today than in past generations, they have evolved over the years to become more hidden and subtle. Far from the overt and explicit racism of the past, today’s society is shaped more by the implicit and unconscious biases that play into the daily decisions of individuals, corporations, elected officials, and administrators who shape our community institutions and structures. Free To Ride is the story of the relentless spirit of community leaders from across Dayton, Ohio who overcame a suburban contingent opposed to the expansion of public transit along an opportunity-rich commercial corridor, and the system of checks and balances that allowed justice and reason to prevail. This modern-day Civil Rights saga began in 2009 when community members in Dayton, Ohio became aware of the danger faced by bus riders seeking to get across a busy interstate overpass in order to make it to their workplace, shopping, medical, and educational destinations along Pentagon Boulevard in the suburban community of Beavercreek. 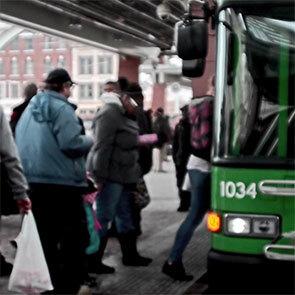 After the local transit authority worked for nearly a year with Beavercreek’s public works staff to develop a proposal to remedy the situation in a way that complied with city ordinances, the process was stymied by concerned members of City Council and vocal residents. In the wake of City Council’s 6-0 vote to reject the proposal to create 3 new bus stops on the other side of the interstate highway, a local legal aid group filed a complaint on behalf of the organized community members who supported the transit proposal, kicking off a two-year investigation by the Federal Highway Administration and a series of policy and publicity battles. Transportation equity has remained an important issue in our country since the end of the 19th century. Although the details of this story unfolded in a particular community in Ohio, these events could have taken place in any metropolis in our nation, making this story a relevant picture about why today’s job markets and transportation networks work better for some than for others. Yet as racial tension continues to grow in the wake of the controversial deaths of young black men at the hands of law enforcement, Free To Ride is a promising story about how hard work, collaboration, and our accountability systems can yield fair and just outcomes for all. Ellis Jacobs, a senior attorney with the Dayton-based Advocates for Basic Legal Equality [ABLE], reached out to the Kirwan Institute in 2013, shortly after the Federal Highway Administration had issued its investigative finding about how the City of Beavercreek had handled the application process to expand fixed-route transit within its boundary. The finding was the first of its kind, and spelled out why Beavercreek was found in violation of Title VI of the 1964 Civil Rights Act, and risked potentially losing millions of dollars of federal funding if it refused to revisit the application under a compliant approach. At the time, Jacobs began advocating for this new and promising approach to discriminatory actions and outcomes, and was reaching out to the Kirwan Institute to identify ways to share this story more broadly. After some follow-up conversations, Kirwan Institute staff began developing a strategy for how to highlight the new Title VI approach, and began production of Free To Ride in April of 2014. 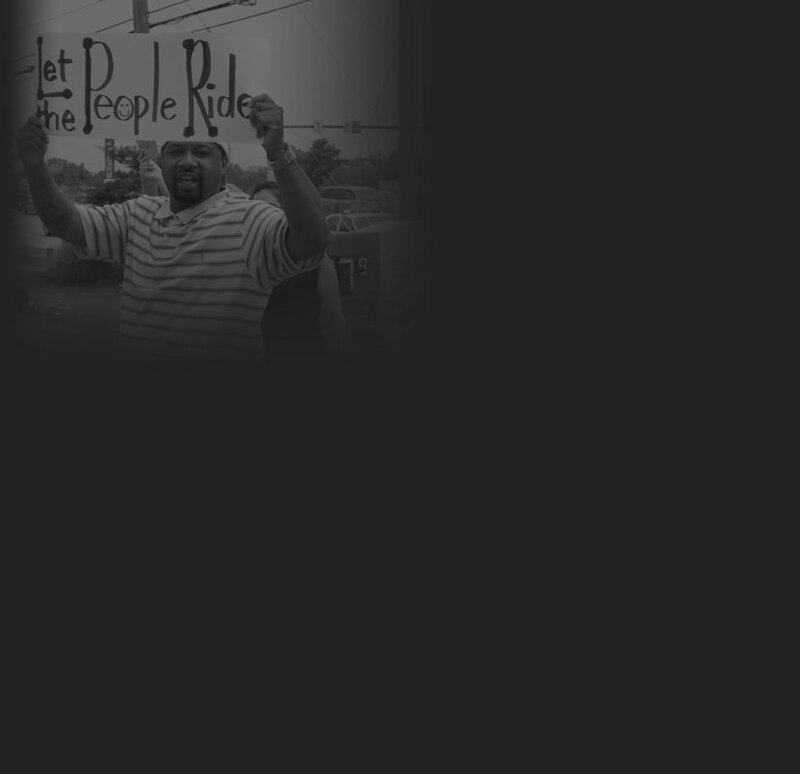 Free To Ride is the story of the relentless spirit of community members from across Dayton, Ohio who overcame a suburban contingent fearfully opposed to the expansion of public transit along a commercial corridor, and the system of checks and balances that allowed justice and reason to prevail. Amid growing racial tension in the United States and around the globe, Free To Ride shows that peaceful change is possible and provides communities with a film they can use to build meaningful equity movements in their part of the world.